Let the Kids Chew Away! Ah, oral hygiene. It can definitely be a challenge to get kids to stick to a regular routine! In my experience, kids start out loving to brush their teeth. My toddlers always are happy to brush... it's the 6+ age that I see a major decline in "willingness" to complete the task thoroughly. It's important, though. Brushing, flossing, and rinsing are important parts to our daily routine, but sometimes the struggle is a bit rough to get through. We've gotten fun toothbrushes to help the kids remember and want to brush...light up brushes, superhero toothbrushes, even fun singing toothbrushes! There are a lot of great products out there to help keep kid's teeth healthy. I want my kids' teeth to be protected...and not just in the morning and at night when they brush. With snacking throughout the day I worry about how clean their teeth are, and if there is anything left in their teeth just sitting there waiting to cause a problem. I want my kids teeth to last well into their adulthood (hopefully throughout their adulthood!) and I love using gum to help do that. Awarded the ADA Seal of Acceptance, Orbit for Kids sugarfree gum helps to rid teeth of debris as well as stimulate saliva which helps protect teeth by reducing plaque acids and strengthens teeth. What a fun option to add to a child's brushing, flossing, and rinsing routine! I know my kids love to chew gum. Even before we tried the Orbit for Kids sugarfree gum, sugarfree gum has been something that my children have enjoyed. 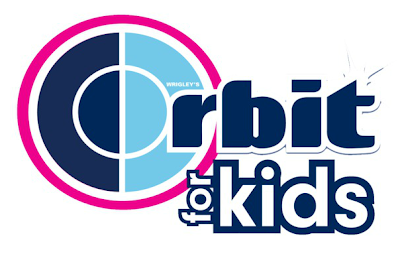 I can say, Orbit for Kids was a huge hit at our house. The strawberry banana flavor really took off with the kids... so much so that we found a few sneaky children hoarding the gum for later! Orbit for Kids also comes in a bubblegum flavor (which would likely be my favorite since it would remind me of my childhood)! Each pack comes with 14 pieces and is priced at $1.29 per pack. Did you chew gum as a kid? Do your kids chew gum?